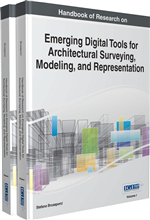 The study of the shape in the architectural survey is the principal goal of the surveyor. Any shape is based on stringent geometric rules that the current digital methods of data acquisition don't detect directly. The basic element in the integrated digital survey is today the point that must to be processed, automatically or manually, to generate a 3D mathematic model. In this chapter the author wants to highlight how these data are important not only for metric information but also to characterize the quality of the shape through the digital photographic techniques. The description of some practical examples proves that in both phases of the survey, acquisition and processing, it is important to know the relations between the shape of the object and the instrumental characteristics in the different methods. Until twenty years ago the architectural survey was a well codified discipline from a methodological point of view. Some phases characterized the activity of survey: a first phase of analysis and understanding of the object to be detected, a subsequent measurement phase, a final phase of representation. Any manual before to describe the methods and techniques that characterize the scientific discipline emphasizes a fundamental fact: the survey is knowledge, analysis, selection, decomposition of an objective reality; is first of all a cultural product and, as such, strongly influenced by the historical context. In the so-called short century a decisive impetus to the objectification of the survey stems first of all from the renewal of the cultural contest and from the gradual overcoming of the nineteenth-century academic vision. Another aspect, equally crucial, is related to the technological evolution of the instruments of measure, so the distinction, already known to the Greeks and Romans, between direct survey and instrumental survey, progressively increases. One might argue about the term instrumental, given that even in direct survey we use tools, some of which are high-tech, such as laser distancemeter and laser levels or aligners. Even the traditional level, the plumb line, the wheels metrics are instruments. So it is more appropriate to distinguish between direct and indirect survey: in the first case the measures are taken on the field for the contact, in the second case are calculated indirectly with procedures related the so-called topographic method. The photogrammetry is a typical method of indirect survey; discipline born in the late '800 and widely used throughout the '900 developed on two parallel paths: the first, stereo-photogrammetric mode based on topographical procedures, and the second derived from the principles of the inverse perspective (straightening). The evolution of the theodolite in total station on one side and the analogical photogrammetry in analytical on the other have resulted in a strong specialization with a sectoralisation of the proceedings but without overcome a crucial concept: the measure is ever more objective, while it remains necessarily prerogative of the surveyor the choice of what to measure and how to discretize the object. In the technological evolution of the '900, however, remains a constant: the survey operation, even in its specialization, remains a unitary process, undivided, in which the measurement is an integral part of the model. The digital age, starting with the 80s of the last century, has opened new scenarios so, within a few decades, all levels of interventions are involved with different weights: the prior investigations, the documentation, the planning of rehabilitation activities, the restoration and conservation, up to the stage of scientific dissemination and use by the community. Principal Point: The point of intersection between the optical axis and the plane of the sensor or film. This point cannot correspond to the center of the sensor to the imperfection of manufacture of the camera and the lens. HDR (High Dynamic Range): Technique to get a picture with wide dynamic range allowing you to record a range of shades ambles that cannot be captured by a single photo. The technique is to take more pictures with different exposures, without moving the camera. Specific software merge the images into one photo dosing and calibrating the extreme exposures. Spherical Panorama: Image that reproduces a spherical field of view 360°. The image is realized by fusion of multiple shots in which the camera rotates around the nodal point of the lens taken as the center of projection unique. Shallow Depth of Field: Defines the portion of space within which the photographed image will be sharp, that is in focus. Compared to the exact point of focus depth is usually greater in the part of the space furthest from the camera. Orthophotography: Commonly referred to as part of the aerial photogrammetry as an image properly adjusted and scaled the term is also commonly used in architectural photogrammetry. The orthophotography is that image, also adjusted, where there is a correspondence between a plane parallel to the object taken as a reference and its image in front view perfectly. Focal Point: Point of convergence of light rays which, through the lens, determine the right focus of the image. Epipolar Geometry: The epipolar geometry studies the relationships and constraints that are established between two or more photographic images that frame the same subject. Focal Length: Distance in millimeters between the optical center of the lens and the photosensitive support. Nodal Point: Corresponds to the optical center of the lens and the center of projection of light rays that impress the photosensitive support. The nodal point changes depending on the objective and also in the case of zoom of the focal distance. Resolution: Indicates the density of dots in a photosensitive support both analog and digital, and then defines the quality of the photographic image. It is measured in amount of points per unit length (usually inches). DPI stands for dots per inch. Perspective in Relief: Architectures or part of them in which are present perspective deformation. Some perspective in relief are similar to bas-relief of great dimension (such as those on the front of the Civil Hospital in Venice, Campo SS Giovanni e Paolo); other are true architecture (such as the Perspective Gallery in Palazzo Spada in Rome). Stereoscopic Vision: In photogrammetry, stereoscopic vision is reproduced through optical devices capable of simulating the three-dimensional observer induced by binocular vision. Occurs through the simultaneous viewing of a couple of pictures that show the same subject from two different points (generally with optical axes parallel). The right image is seen only by the right eye; the left image only the left eye. The brain merges the two images into a single image with three-dimensional effect. Photosensitive Support: It’s the support that physically records the photographic image. In analog photography the support is a film composed of layers between which the main one is the emulsion of silver halide which reacts to light rays. In digital photography, the support is formed by a CCD or CMOS sensor. Calibration: Procedure for determining the parameters of image deformation caused by the camera-lens system. Stitching: Technique that allows you to merge and combine multiple images in a single photograph. Typically used in spherical panoramas but also in orthophotomosaic to increase the resolution of the photographic image. CCD / CMOS Sensor: Support photosensitive digital format photodiodes minimum elements that convert the light signal into electrical charge. The CCD and CMOS sensors are based on two different technologies for the conversion of the light signal. Beyond the strictly technical aspects is important to point out the main differences in quality. The CCD generates an image of better quality with less noise, the CCD consumes more energy; the CCD is more expensive; CMOS is more versatile and more manageable in small systems.